In the fictional TV series Star Trek a replicator is used to create the food of your choice. This Science Fiction device could be closer to reality following a project by a team from the Computational Synthesis Lab at Cornell University. 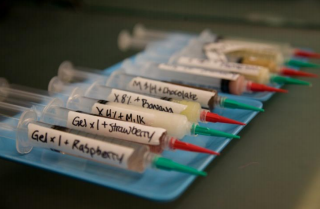 Its based on the Fab@Home 3D Printer platform, using hydrocolloids (xanthium gums and gelatin) and flavour additives as the printing materials which are loaded into syringes and placed on the printer head. A 3D bio-printing machine has been developed by Organovo, and is intended for use in the manufacture of human tissues and organs. at about 10:56 in to the video you can watch a modified inkjet printer at work printing a 'heart'. 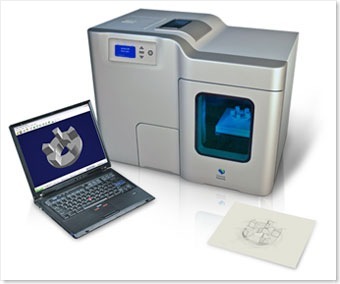 Fab@Home is another project for making and using 3D printers, or rapid prototyping machines, and provides all the information necessary to build or buy your own machine that you can use to print 3-dimensional objects. It's that time of year when we start to read a lot about "the best of 2007" and "things to watch for 2008". 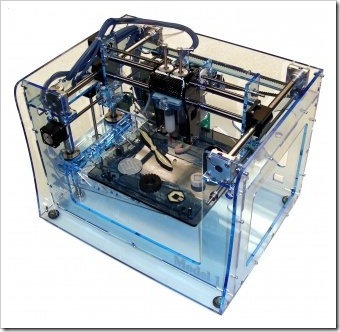 One of my own favourites, which I noticed during 2007, is the 3D printer from Desktop Factory. 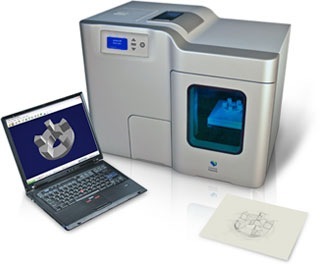 This is a printer which "prints" 3D models (to a maximum size of 5x5x5 inches), from a composite plastic powder at an estimated cost of about $1 per cubic inch. What attracted my attention to this device was the price - at $4995 its a fraction of the cost of typical industrial machines and brings it (almost) within reach of the home (hobbyist) user.